Welcome to the July 5th edition of Sunday Scratchups, your weekly recipe from scratch around sales and affordable ingredients. Our next mystery sale ingredient is: Cauliflower, since we’ve seen a lot of great prices on this lately! And because, it’s so good when you grill or roast or otherwise bring out its inherent nutty sweetness. 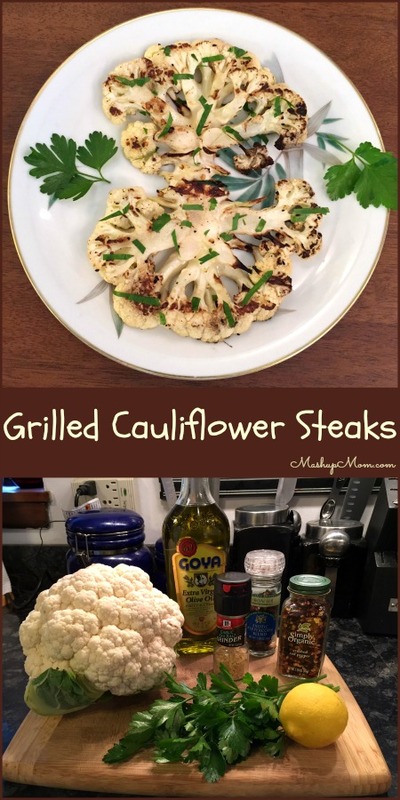 I’ve seen cauliflower “steak” recipes floating around for years, but they all basically boil down to: Cauliflower + olive oil + seasonings of your choice + grill it! This week I finally gave it a try with some very basic seasonings, and these turned out surprisingly yummy for such a simple recipe. Mix olive oil, lemon juice, garlic salt, pepper, and crushed red pepper in a small bowl. 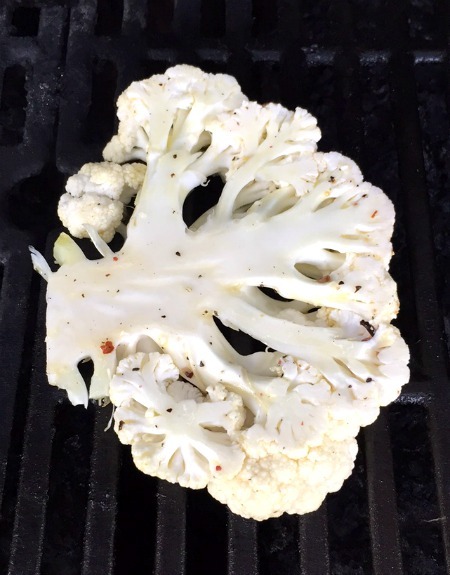 Generously brush both sides of your cauliflower steaks with the olive oil mixture, then grill over medium heat for 5 minutes a side (10 minutes total) or until fork tender. Serve garnished with parsley and/or Parmesan cheese (optional). … I am thinking that I might actually add some Parmesan after flipping the cauliflower so it melts on there nicely while the second side grills, but these were pretty tasty both with and without cheese. 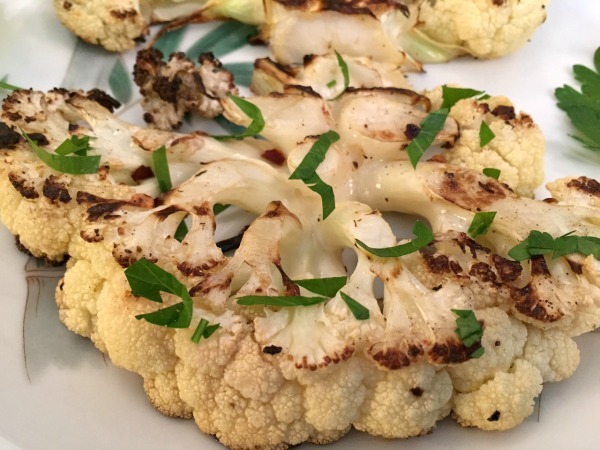 These super simple cauliflower steaks would make a hearty and healthy side at your next summer BBQ, or would serve nicely as an easy vegetarian entree, either on their own or as a burger. 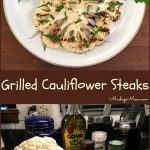 Cauliflower steaks are gluten free, dairy free (if you don’t add Parmesan), and low carb, and you could easily jazz them up with different seasonings to match the rest of your meal. 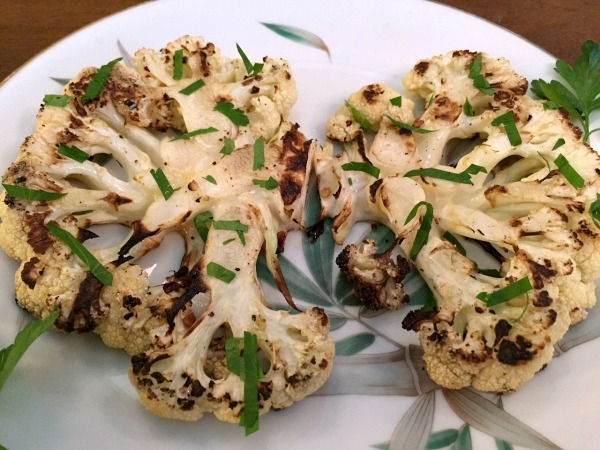 These super simple cauliflower steaks would make a hearty and healthy side at your next summer BBQ, or would serve nicely as an easy vegetarian entree, either on their own or as a burger. Chop the end of the stem off your cauliflower, leaving a bit in place to hold it together. 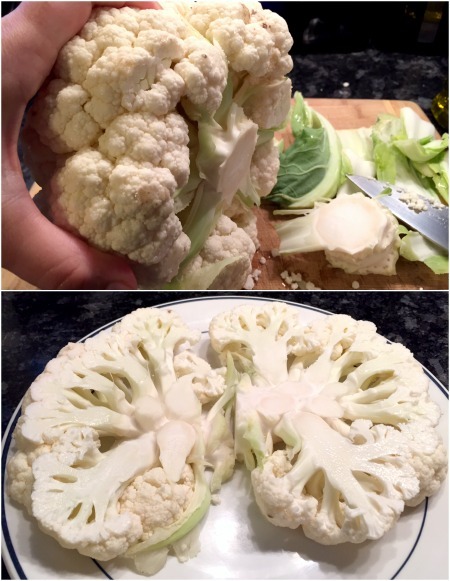 Slice your cauliflower into thick vertical slices, then remove any leaves remaining on them. Mix olive oil, lemon juice, garlic salt, pepper, and crushed red pepper in a small bowl. 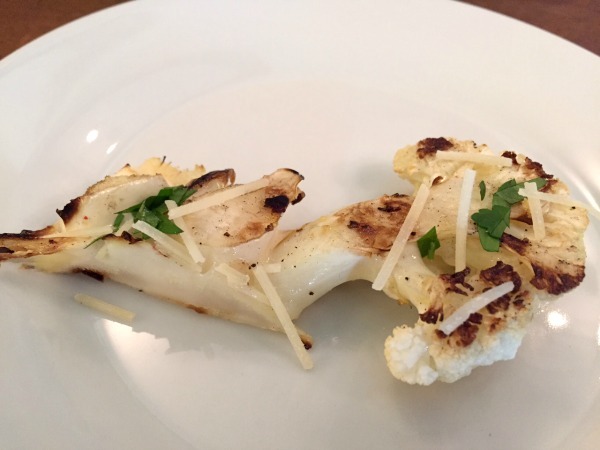 Generously brush both sides of your cauliflower steaks with the olive oil mixture. Grill over medium heat for 5 minutes a side (10 minutes total) or until fork tender. They look really pretty and we already like cauliflower, so, thanks for posting. I have seen a lot of this type of recipe, but, forget about it when grilling. Saturday I cut up the .98 pineapple I got at Jewel the other day and we grilled it. I did 1/2 sprinkled with brown sugar and cinnamon and the other 1/2 without. We all liked it better plain and it’s way less messy. Anyway, it didn’t add any outstanding grill flavor, but, it was very nice and sweet and looked pretty. Cauliflower! Yum!! Rachel, how do you like the Goya olive oil? I haven’t tried it and I go through a lot of olive oil. Also, where are you buying lemons? I noticed they were $1 each at Jewel this week. Yikes! The Goya olive oil is great! There is a $1.50 coupon on their site, too. Jewel is generally NOT the place for lemons, lol — I usually get mine at Pete’s Fresh Market. I noticed they were 3/$1.00 there this morning, but they sometimes go cheaper.